On 20 May 2011, the Committee on Economic, Social and Cultural Rights (UN Office of the High Commissioner for Human Rights) adopted concluding observations following its review of Turkey’s initial report on the implementation of the rights enshrined in the International Covenant on Economic, Social and Cultural Rights (ICESCR). The process is designed to strengthen collaboration between State and civil society actors around human rights promotion and protection. In advance of this review, Kurdish Human Rights Project (KHRP) had raised a number of concerns about Turkey’s compliance vis-à-vis the Kurds with its obligations under the Covenant by submitting a list of issues to the committee. KHRP also attended the Committee’s review of Turkey’s report, which took place in Geneva on 3 and 4 May 2011. This was a part of the Committee’s 46th Session. The Turkish nation is composed of citizens equal before the law irrespective of their origins. In the context of the Turkish nation, common denominator is citizenship. Every citizen has the right and power to lead an honourable life and to enhance his/her material and spiritual well-being in national culture, civilization and law order, by benefiting fundamental rights and freedoms set forth in the Constitution, in line with the principle of equality and social justice. Every Turkish citizen has effective access to government to pursue their political, economic, cultural and social development. KHRP’s ‘List of Issues’ report methodically examines the Turkish report, poses questions and concerns, and then offers extensive background information regarding each particular article of the ICESCR. Regarding Article One, for example, KHRP asked for information on the steps the Turkish Government was taking to promote the right of Kurdish people to self-determination, details of any policies and measures being pursued by the Turkish Government to ensure that Kurdish people are proportionally represented in national and regional political parties, and details about the people arrested under laws prohibiting written Kurdish in election campaigns and the proportion of those who are Kurdish. 1. The Turkish Constitution was designed, in 1982, in conformity with Turkey’s strict adherence to a single Turkish nationalism. By failing to recognise any other ethnic identity except Turkish, Turkey refuses to grant its ethnic minorities their right of self-determination.1 For the Kurds, who make up approximately 23 per cent of Turkey’s population, this refusal is felt through Turkey’s embargo of their cultural and political freedoms. 2. The boldest way by which the Turkish Government denies Kurdish people their right of self-determination is through the criminalisation of political organisations and civil society institutions which advocate Kurdish rights and freedoms. By aligning political sympathies for the Kurdish people with a separatist threat, the Turkish Government has been able to use anti-terror laws to outlaw pro-Kurdish parties, expunge their members from parliament and authorise their subsequent arrest. Since the early 1970s the Turkish Government has instigated a policy of systematically banning peaceful and legitimate Kurdish political parties. This long-standing policy has had a constraining effect upon the ability of Kurdish parties to participate in the Turkish political system. 3. A second exclusionary device takes the form of prohibitions on written Kurdish languages in election campaigns. 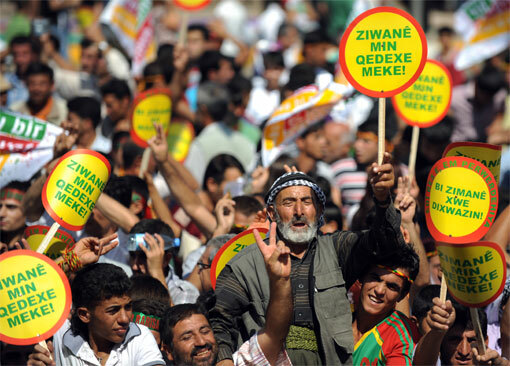 Laws which formerly prohibited spoken Kurdish have, in the past, justified the imprisonment of members of Kurdish political parties. The number of Kurdish people arrested under the present prohibition on written Kurdish is unknown. A corollary effect of this language restriction is the preclusion of Kurdish citizens from participating in the election process, many of whom cannot read Turkish. 4. Without democratic decentralisation in the Kurdish regions, the ability of Kurdish people to contribute to the formulation of national policies is extremely limited. The establishment of a properly representative decentralised body or bodies in the Kurdish region is essential for the realisation of Article 1 of the ICESCR by Kurdish Turks. In each successive article, KHRP cites extensive research and legal casework to demonstrate significant areas where the Turkish Government has failed sufficiently to meet its obligations under the ICESCR, in spite of statements that it makes in its initial report submitted in June 2008. To fully appreciate the failings of the Turkish Government to ensure economic, social and cultural rights of the Kurds in Turkey, it is essential to read the International Covenant on Economic, Social and Cultural Rights, then the report submitted by Turkey, followed by the KHRP ‘List of Issues’ report. The ICESCR can be downloaded here (.pdf). Turkey’s report to the Committee (June 2008) can be downloaded here (158-page Word document). The Committee’s questions/issues (June 2010) for the Turkish delegation can be downloaded here (5-page Word document). The KHRP ‘List of Issues’ report (May 2010) can be downloaded from the KHRP website here. In the concluding observations, the Committee noted principal subjects of concern and provided recommendations for Turkey. KHRP welcomed, in particular, the comment that in light of the fact that Turkey ‘recognizes only Greeks, Jews and Armenians as minorities, the Committee expresses concern about the absence of a broad legislative framework for the recognition of all minorities…including the Kurds, the Roma and the Arameans.’ KHRP joined the Committee in urging Turkey to recognise all the minorities in its territory and to provide them the full opportunities to enjoy their economic, social and cultural rights and to adopt the necessary plans of action for this purpose. The full report on the Committee’s concluding observations can be downloaded at the 46th Session Website. 10. There is no comprehensive law on non-discrimination in Turkey. The existing legal framework is fragmented and refrains from incorporating sound and effective measures aimed at eradicating discrimination against the Kurds. A first step towards this goal requires that statistical information about Turkey’s ethnic or linguistic groups is obtained. As yet the Turkish authorities have failed to conduct any such census or other comprehensive survey along these lines. 12. The only legislative provision outlined in Turkey’s report which has as its specific rationale the elimination of discrimination is Article 216 of the Penal Code, which is concerned with the incitement of racial hatred. However, this provision has not been applied to oral, written or other expressions which target the Kurdish population. Further, the European Commission has criticised its discriminatory application by certain public prosecutors in order to prosecute personalities expressing “pro-Kurdish views”, rather than to punish racist remarks. 13. Turkish official policy on minorities is based on the Lausanne Treaty signed on 24 July 1923, which provides protection only for non-Muslim minorities. Since the majority of Kurds follow Sunni Islam, they are excluded from minority protection. In contra-distinction to religious minorities, such as Greek-Orthodox, Armenian and Jewish peoples, the Kurdish identity is not recognised by the Turkish legal framework. As a result, Turkey’s most significant minority population are denied the rights available to non-Muslim minorities. 15. The Parliamentary Assembly of the Council of Europe in its Recommendation 1201 (1993) proposes the following definition: “… the expression “national minority” refers to a group of persons in a State who: a) reside in the territory of that State and are citizens thereof, b) maintain long-standing, firm and lasting ties with that state, c) display distinctive ethnic, cultural, religious or linguistic characteristics, d) are sufficiently representative, although smaller in number than the rest of the population of the State or of a region of that State, and e) are motivated by a concern to preserve together that which constitutes their common identity, including their culture, their traditions, their religion or their language.” Turkey should adopt this definition in order to give effect to Article 2 of the ICESCR. In May 2003, the European Parliamentary Commission on Foreign Affairs, Human Rights, Common Security and Defence Policy condemned Turkey’s refusal to accommodate the linguistic and cultural rights of the Kurds and stressed the need for Constitutional reform. This sentiment has since been echoed by other European bodies. 27. The discrimination faced by Kurdish women with regard to access to education stems from Article 42 of Turkey’s Constitution, which provides that only Turkish may be taught as the mother tongue in Turkish educational institutions. A study in Turkey examining the influence of speaking Turkish on socio-economic indicators found that 90 per cent of women in the eastern and southern Turkish regions who do not speak Turkish did not finish primary school, are illiterate and are employed either as agricultural or unpaid family workers. This study further concluded that since Kurdish women and girls speak Kurdish at home, any restriction on educational opportunities will subsequently restrict any opportunities to learn Turkish and integrate into mainstream society. Although the KHRP recognises that this information precedes Turkey’s ratification of the Convention, there is a dearth of more up-to-date information about the impact of speaking Turkish on socio-economic indicators in relation to Kurdish people. 54. Restriction of trade union activities and labour rights by the Turkish authorities has a particularly negative impact on the country’s Kurdish population. Kurdish trade unionists have been subjected to allegations of involvement in terrorism, as is the case with many Kurdish politicians, socialists, lawyers and anyone else who argues for rights for the Kurds or working people. Furthermore, union activities must be carried out in Turkish, weakening the ability of Kurds to organise on their own terms. Eğitim-Sen was forced to remove a clause in its constitution supporting the right to education in one’s mother tongue. Kurds are also particularly vulnerable to the practice of ‘internal exile’ of activists, the compulsory transfer of an employee to a part of the country far from home, without the possibility of being accompanied by spouse or family. An unspoken but well understood element of this practice is that it involves uprooting a person generally of Kurdish origin, ethnicity and language group and transferring him to a Turkish-speaking area where they will be more or less isolated. Freedom of expression is not applied in the same manner to the Kurdish language as it is to the Turkish language. Furthermore, the Turkish Government links Kurdish associations to terror groups. 116. Such discrimination is also found in the area of expression of Kurdish culture. Celebrations such as Newroz, the Kurdish new-year celebration, are limited and overseen by the authorities. The Government’s refusal to support such cultural issues results in violence and arbitrary detention. 117. Kurdish culture is also found in the Kurdish alphabet which is different to the Turkish alphabet. The Kurdish alphabet has the additional letters of “Q, W, X”, which are prohibited in Turkey. Although such letters can be used in Kurdish names people will be unable to register them for official use. The recent case of Kemal Taşkin and Others v Turkey highlights these issues the Kurdish people struggle with. Self-congratulatory end note: In its report to the 46th Session Committee in Geneva, KHRP (in Article 13: Right to Education) cited Kurdistan Commentary’s report on Mother-tongue education in Kurdish (06 Dec 2009). Kurdistan Commentary is proud to be a contributing part of this process. This entry was posted in culture, human rights, language, media, politics and tagged human rights, Kurdish, Kurds, Turkey, United Nations by KB. Bookmark the permalink. Inveterate blogger, newshound, media junkie, mostly interested in politics, language rights, media freedom, human rights. Thank you for all your input, yet next time please ensure that hyperlinks actually work.